People say Heavyweight boxing is "The worst it's ever been" and "The worst division in boxing", it may not be as good as it used to be, but look at these up-coming fights, and you'll realise that today's Heavyweight division isn't as bad as people make out. Chris Arreola Vs Bermane Stiverne - This is a must see fight. Someone, in my opinion, will get Knocked-Out, and it won't be pretty. Both guys have a high KO ratio, Arreola's is 81% and Stiverne's is 83%. Arreola has fought the much better competition, but Stiverne has the power to hurt any Heavyweight on the planet. Take a look at his brutal KO over then unbeaten, Kertson Manswell. So that's six Heavyweight fights to watch this year. Don't forget, we are in November, so most of the Heavyweight action has already happened. We had Price/Harrison, Chisora/Haye, Chisora/Vitali, Pulev/Dimitrenko, Fury/Rogan, Klitschko/Wach, Adamek/Chambers and more. What do you think of the up-coming Heavyweight schedule? 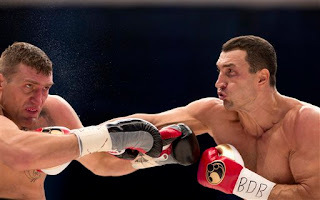 What fights do you want to see made in the Heavyweight division?